I managed to fit in a couple of foodie experiences on my first day in Namibia, which is located in South Western Africa and is supposed to be one of the two safest African nations (although I gather that it's all relative). Its major cities Windhoek and Swakopmund (kind of like the Namibian version of Dunsborough) have pretty good infrastructure - excellent roads, interesting architecture, modern supermarkets. Kinda like Perth 10 years ago, really. Even the smaller towns in the country are reminiscent of little Aussie towns, and the geography is similar to what you'd see in the north of Australia. Given that you can find uranium, iron ore and base metals in both countries, the similarities in geography is unsurprising, I guess. But there are certainly things which remind you that you're not in Kansas anymore. The first of these are the local taxi drivers. Taxis don't have uniform paint-jobs like they do in most parts of the world that we're familiar with. These cars come in all shapes and sizes. But you can easily spot a taxi by the large white serial number on the rear windscreen. And the way they drive. These nutters will turn right at a 3-lane intersection - from the far-left lane. When the lights are still red. They will stop anywhere they like to pick up a fare. Here's an example of a mass of taxis stopped outside a local market. In all 3 lanes. No it's not a traffic jam, because the road is clear after you get past the taxis. Not so good when you're in a hurry to get somewhere. You can't see it in the picture, but some of these guys are negotiating taxi fares with would-be passengers. Others are trying to squeeze more people into an already full vehicle. The other thing is the prevalence of gambling houses. Here's one right in the middle of the city. Check out the name. The third thing is the road signs. What do you do when a herd of elephants cross the road in front of you? Well, you certainly don't use the horn. Not unless you have a death wish. Also, one of the main boulevardes in Windhoek has a dubious name. Ironically, it connects to Nelson Mandela Avenue. Even more ironically, there's an international aid/human rights agency located on this street. Obviously outraged at their prestigious address, they insisted on building a side road with a more acceptable name, plonking their letterbox on it, and putting that down as their official address. Okay - enough of the virtual tour of weird and wonderful things. Let's move onto the cuisine! 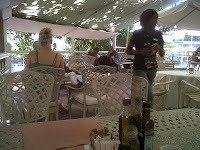 The first of my culinary experiences in Windhoek is Cafe Balalaika. 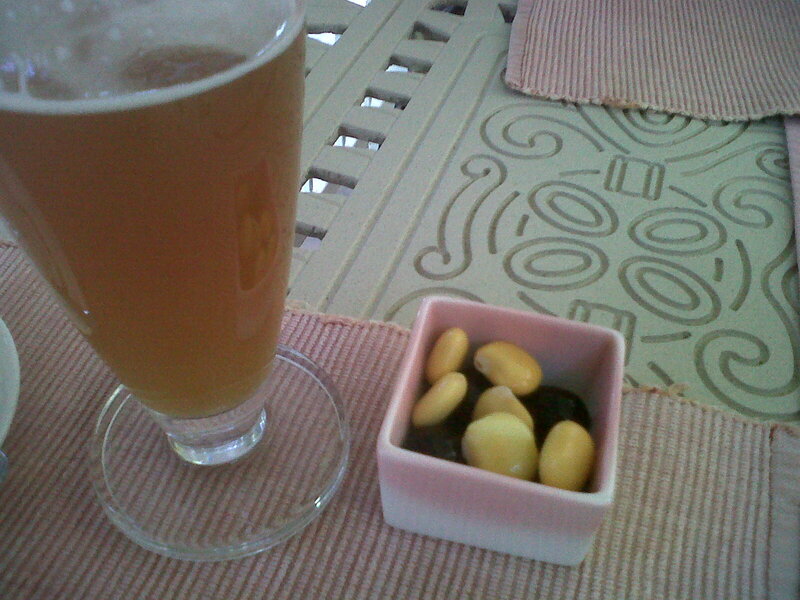 The second is Joe's Beerhouse. Restaurant Balalaika (named after the 3 stringed traditional Russian instrument), more a cafe, really, is located in a local park/square. 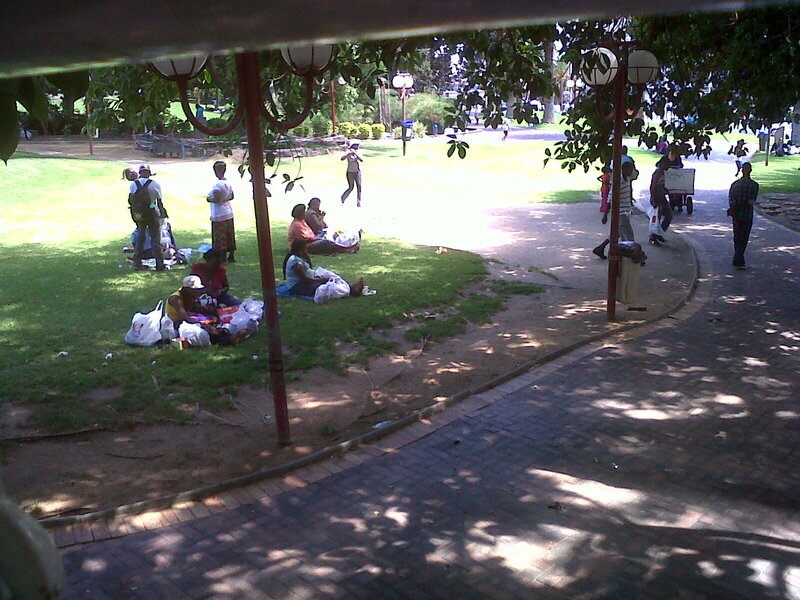 Its large balcony area is extremely well shaded with a combination of shade sail and huge, leafy trees, and gives one a nice outlook over the locals relaxing in the park. Namibia, formerly a German colony, has a number of Germanic influences. One of these is the locally made beer. Boutique brewery Camelthorn (so named not because of any connection to foot appendages, but because they identify themselves with the deep-rooted, drought surviving indigenous Namibian Camelthorn tree, which incidentally also makes great firewood). The weissbier was truly delicious - all the things you'd expect from a weissbier - soft, mouth filling richness, fruity flavours with a hint of sweetness, and no bitterness at all. The recipe for this Bavarian style beer is designed by Bavarian world champion brewmaster Michael Plank, and it's brewed using ingredients from Germany. How does it measure up to the benchmark Weihenstephaner weissbiers? I reckon that it'd hold its own. 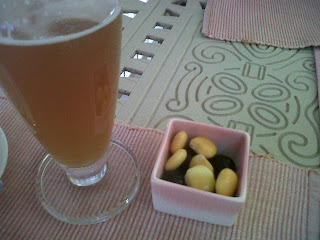 The beer also came with the local version of beer snacks: a yellow, crunchy yet juicy broad bean-like bean, and tasty black olives. What's even better, with a number of other patrons smoking cigarettes, I felt no compunction against lighting up a mild but flavoursome Romeo y Julieta No.1 to accompany my second beer, the Camelthorn Liquid Gold, which is a refreshing clear, crisp golden lager. A cleansing ale indeed. The perfect holiday afternoon! Joe's Beerhouse is basically your local themed restaurant, specialising in dishes involving local produce, many of them having spent their previous lives pronking around the Namibian bush. Just take a look at the menu - 'nuff said. This establishment is a massive place, with multiple rooms stuffed with tables and people feasting on meat, meat and more meat! We got a big trestle table for the large contingent of people who'd arrived for my best mate Brandon's wedding - a whole bunch of Russians, a couple of East Germans, and the ubiquitous Aussies. 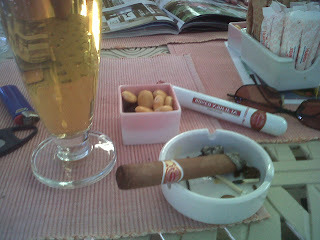 Of course, a good meal is incomplete without all the accoutrements. Yes, yes, the decor, lighting, service and all that are important (and all of these scored high marks at Joe's). What I'm talking about is the company. A great bunch of eclectic people from all around the world, some of whom spoke very little English (fortunately I had been brushing up on my very rusty Russian). I also made an important discovery - peoples' foreign language skills appear to magically improve dramatically in direct correlation to the amount of alcohol imbibed. Vladimir (Volva to his friends) and I had a halting start to our conversation, with many repeats of очень хорошо and Вкусно in relation to our food, beer, wine and company. By the end of the evening, we were earnestly discussing the advantages and disadvantages of the Макаров (Makarov) over the Western 1911 design. When you add all these things together, this was truly a memorable and enjoyable evening - it was truly Вкусно и красиво!